Sarnia, Ontario, Canada, June 15, 2015 — Field instrumentation protection specialist Intertec is seeing increased customer demand for equipment housings to contain wireless process monitoring equipment in outdoor environments. The company attributes this partly to increased use of industrial wireless sensor network (WSN) technology, but mainly to the growing industry awareness that the glass-reinforced polymer (GRP) composite material it uses for all its protective enclosures is electromagnetically transparent. Until recently, process industry take-up of WSN technology has been relatively slow, possibly because competing wireless standards have made systems designers wary of making the wrong choice. However for mainstream industrial process applications, the field has now narrowed to just two standards – WirelessHART and ISA100.11a. Both standards define secure, self-healing wireless mesh technology operating in the 2.4 GHz ISM band, using IEEE 802.15.4 standard radios. ISA100.11a systems use Internet protocols and are designed for multiple wireless communications purposes, while the simpler WirelessHART systems are primarily intended only for use with process instruments; they are also backward compatible with wired HART devices, which are used extensively within the process sector for remote data acquisition. Intertec has long been aware that one of the many benefits of its GRP composite material is electromagnetic transparency – it produces a wide range of frangible environmental protection cabinets and shelters for radar and instrument landing systems at airports which are designed not to reflect or interfere with radio signals. The housings are also used extensively for cellular and satellite communications applications, as well as satellite navigation systems; the GRP material causes no measurable loss of received or transmitted RF signals, so the equipment antennas can be contained within the enclosure. However until now, Intertec has not actively promoted the fact that the non-metallic construction of its products is also ideally suited to field-based 2.4 GHz wireless sensor networks, especially for applications where external antennas are inadvisable because of their susceptibility to accidental damage. A number of Intertec’s customers, as well as manufacturers of wireless process monitoring automation, have started to evaluate the electromagnetic performance of its GRP-based enclosures for housing field-based WSN equipment. Initial results are very promising: third-party tests involving a WirelessHART gateway and a WirelessHART field device, both with built-in antennas and sited in different rooms, found that when the field device was placed inside a standard Intertec instrumentation enclosure it continued to function properly, with no measurable loss of signal. The tests were conducted using a model from Intertec’s Multibox range, but the same results are likely to be obtained from many of the company’s enclosures that use a similar form of construction, including its popular Diabox range. Both types of enclosure are molded from hot-pressed GRP. They are optionally available in ATEX-compliant antistatic versions for use in hazardous environments and can also be fitted with an internal layer of polyurethane foam for additional thermal insulation – all of the materials are electromagnetically transparent and have no effect on signal reception or transmission. Many of the leading wireless process monitoring instruments on the market, including a number of pressure, flow and level transmitters, offer the option of local (on-instrument) or remote antennas. However, if the instrument needs to be housed in some form of enclosure to protect it against a harsh environment, this choice will not be available if – as is commonly the case – the enclosure is made from a metal such as steel or aluminum; its RF shielding effect will necessitate use of a remote externally mounted antenna to secure adequate signal strength. 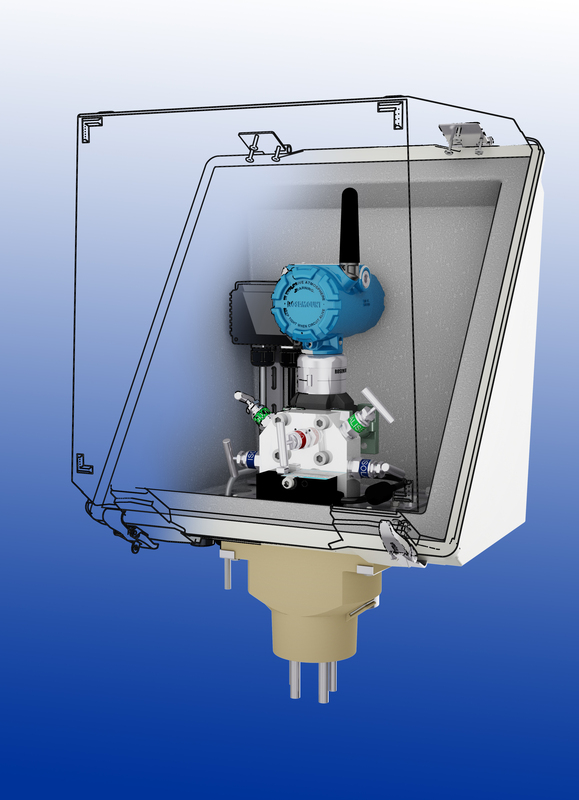 Aside from incurring additional implementation costs, use of an external antenna also involves drilling an extra hole in the enclosure – probably in its top, which is potentially the worst place for leaks – and leaves a delicate structure open to physical impact. Intertec manufactures all its protective enclosures for field instrumentation from proprietary GRP, either in the form of a single layer or a multi-layer composite containing one or more cores of special insulating and/or fire resistant materials. As well as being electromagnetically transparent and an excellent electrical insulator, the material has multiple advantages for plant designers seeking to protect field instrumentation against environmental effects, especially for long lifecycle applications and where harsh media or severe local climatic conditions might be encountered. GRP is inherently inert and immune to damage from most common chemicals and petrochemicals. It has a similar strength to steel, but weighs about four times less, and will not corrode in the presence of salt – which is why it is increasingly becoming the enclosure material of choice for offshore and coastal oil and gas applications. GRP also has low flammability and is self-extinguishing, as well as having a very low thermal conductivity that makes it easier to implement efficient, condensation-free enclosures. 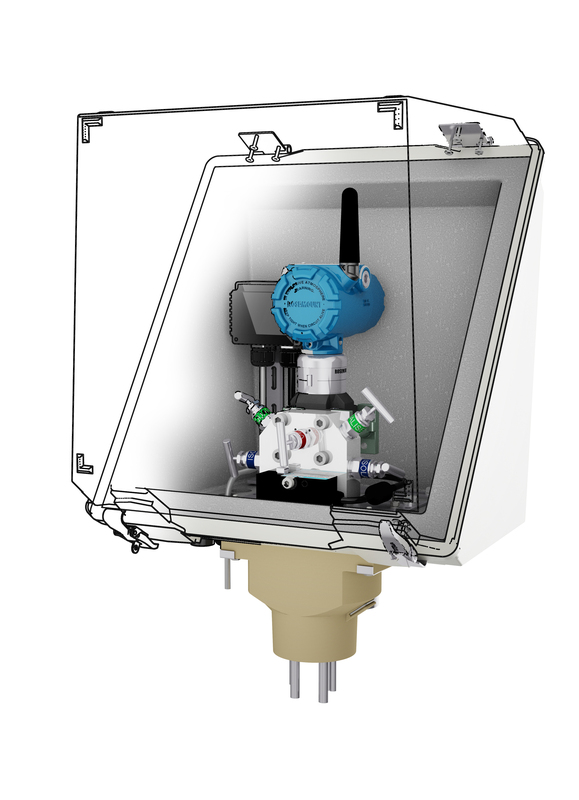 Intertec’s electromagnetically transparent GRP enclosures are ideal for field protection of wireless process monitoring instruments such as pressure, flow and level transmitters.